Spanakopita is one of my favorite dishes and I’ve had a history with it on this site. I’ve since done some fun riffs on the traditional Greek dish like a pizza version. This Greek Quesadilla is yet another take on it and actually the easiest of them. It’s a quick meal and really tasty and interesting. The filling sets up a bit in the quesadilla because of the eggs, but since there is some good mozzarella cheese, it gets melty also. It’s Tex-Mex meets Mediterranean meets dinner. 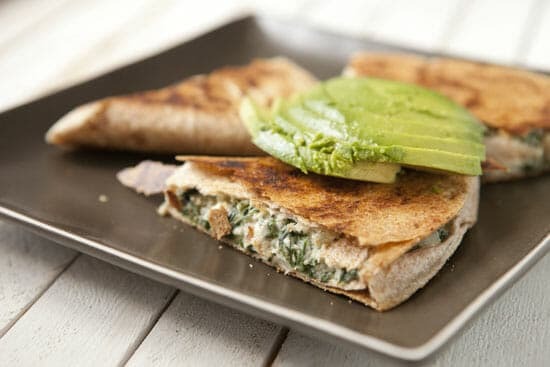 This is a delicious spinach quesadilla with a Greek twist. 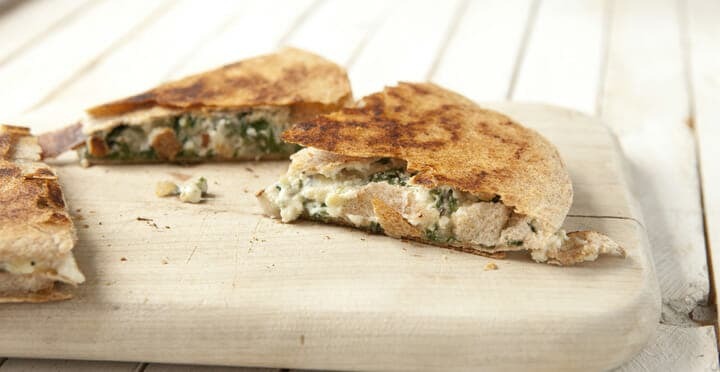 This tastes almost like classic spanakopita smashed into a yummy quesadilla! 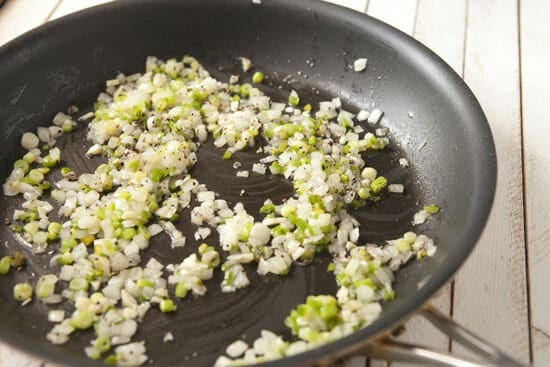 1) In a large skillet, add a drizzle of olive oil followed by pepper, onion, scallions and garlic. Cook until veggies soften, 4-5 minutes. 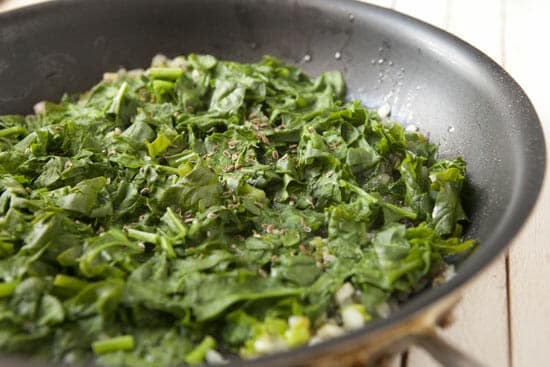 2) Chop and wash spinach well and then add to the skillet along with dill seed and a pinch of salt and pepper. The spinach will start to wilt almost immediately. Cook for a minute or two until spinach is wilted. Remove skillet from heat and let cool briefly. 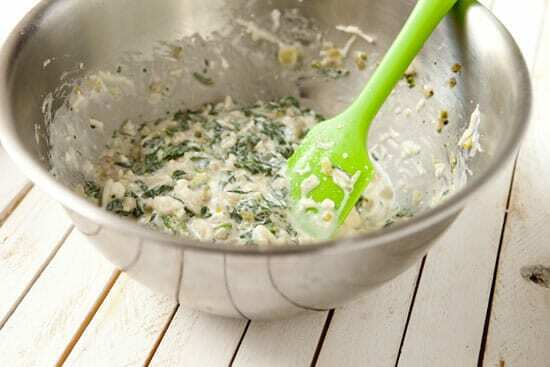 3) In a medium bowl, whisk together eggs, ricotta, yogurt, feta, and mozzarella cheese. 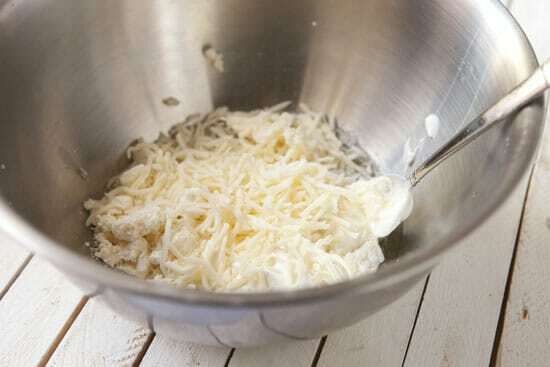 4) Fold in the skillet ingredients into the dairy ingredients. 5) To make a quesadilla, wipe out the skillet that you cooked the veggies in and add a fresh drizzle of oil. 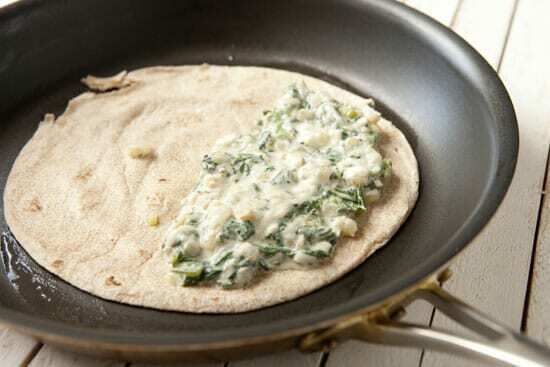 Add one tortilla to the skillet over medium heat and spread on some of the spinach filling on one half of the tortilla. It might look too runny, but it will firm up as it cooks. 6) Fold tortilla over the filling and cook for about 4 minutes per side until the tortilla is nice and crispy and the filling is cooked through. 7) When quesadilla is cooked through, remove it from the skillet and slice it into 3-4 pieces. Serve the quesadilla with avocado and hot sauce if you want! This is a pretty basic filling and the only real trick to remember is to go heavy on the spinach. It will wilt a lot and it’ll get lost in filling if you don’t use enough. Don’t even bother with baby spinach. Just grab a big bunch of the adult stuff and chop it up. You can use the stems also, but just chop off the root ends. Rinse the spinach really well under cold water because it’ll have lots of dirt on it. You don’t really have to worry about drying it like you would if you were making a salad. 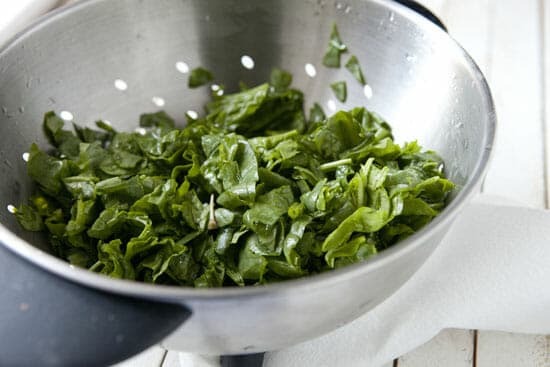 The water clinging to the spinach will actually help it wilt more when you add it to the skillet later. To start the Greek Quesadilla filling, add a drizzle of oil to a large skillet over medium heat. Then add the garlic, Serrano pepper, scallions, and onion. Season it with salt and pepper and cook it until the veggies are tender, about five minutes. Then add the spinach and dill seed. Traditional spanikopita has a lot of fresh dill it and the dill seeds give it some of that flavor without being overpowering. This stuff will wilt almost immediately. Meanwhile, whisk together the dairy ingredients in a medium bowl. You can use either sour cream or greek yogurt. When the filling is done cooking, let it cool for a few minutes and then just fold it into the dairy and your filling is ready to go! This filling will look too wet at this point, but don’t worry. Once it gets hot in the quesadilla, the eggs will set up and it’ll be just fine. You can cook the quesadillas in the same skillet as you cooked the filling or you can cook them on a griddle or in the oven. There are a lot of options. Add a drizzle of oil to the skillet and lay down a tortilla. Then add the filling to one side of the tortilla. Again, don’t worry if it looks too liquidy at this point. Cook the quesadillas for about four minutes per side until the tortillas are nicely browned and the filling is cooked through. As you can see, it firms up awesomely when it’s done cooking. The crispy tortilla with the melted cheese and spinach mixture is a real hit. It tastes a lot like spanikopita but the Serrano peppers, avocado, and hot sauce give it a nice Tex-Mex twist. This Greek Quesadilla checks a lot of boxes for people. It’s Mediterranean, Tex-Mex, vegetarian, quick and easy to make, but most importantly… really darn good. Had this for dinner on the grill and it was awesome :) even had some tomatillo salsa and chips- definitely passed as tex mex even with the greek twist. We really liked this! Used twice the amount of fresh spinach. 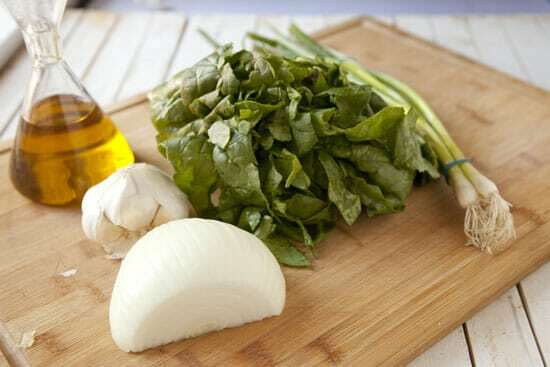 Instead of olive oil, used a spray oil instead to keep down calories. « Fresh Peach and Sausage Sandwich Recipes Home » Guess the Food: Organic!